Simone’s normally quaint little town of Tranquility gets a little ‘Silence of the Lambs’ injected into it this issue. As the superhero citizens of the town learn the identity of the villain that’s been on the attack things get a little tense. Simone has introduced a great new villain during this series. He has proven himself to be a true threat even to the more powerful residents of Tranquility. 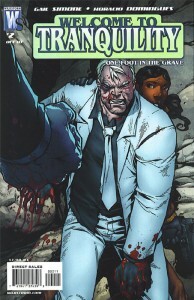 His motivations also take a darker tone this issue as Sheriff Lindo reveals a past connection she has with the villain. 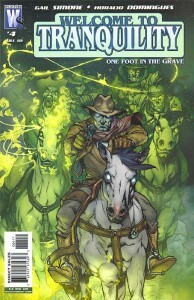 Gail Simone is a true master of the story telling device “the plot thickens”. This is only the 3rd issue of this mini-series and she has packed so much story into this series so far. She is also doing a great job of balancing all the characters which is no easy task with an ensemble cast. The story behind the villain of this story could have easily been written off as a cliché. But Simone takes us down some dark places as we see the true nature of this villain. We also find out pretty quick how he got this way. This new character she’s introduced is really powerful and it leads to some disturbing uses of his powers. This issue is really about him as the other characters can do little else but be reactive to the events unfolding before them. 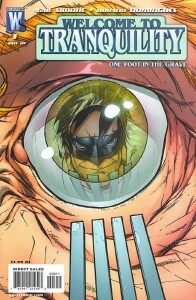 Gail Simone does know how to write a fun comic. This little venture back into the town of Tranquility has her in top form as she crafts another great mystery while not skimping on the humor. The opening pages are great! 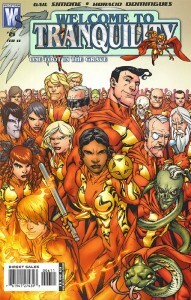 They offer more back story on the characters of Tranquility in fun and unique ways just like Simone did in the original series. But don’t think these little nuggets are just for fun. If you pay attention you can start putting together some of the mystery. This is especially true with the last page. I thought it was brilliant.